Central Asia has a long history most of which we never hear about in western classrooms or in Sunday school. For example, when we see the word “silk” used in the Bible, do we ever stop to think where silk came from in Bible times? All silk came from China in those days. It arrived in the Middle East by way of Central Asia, through countries like Tajikistan and Turkmenistan. Two city blocks from where I live there is an avenue called, “Jibek Jolu”, which means, “Silk Road”. But the story begins long before then. 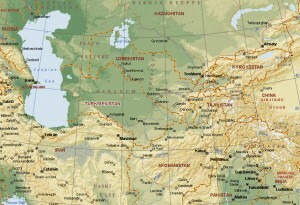 God’s people were already in Central Asia during the fifth century BC. You can read all about it in the book of Esther. It was also during this time in history that the Silk Road came into being. Some say the east and west were connected in this region when military leaders came from China looking to purchase Central Asian horses. As Christians we are taught that God used the Roman Empire to spread the Good News throughout the Mediterranean region. But God was also preparing a way to the East just in time for Jesus’ birth. And spread it did. Tradition holds that the Apostle Thomas travelled throughout Central Asia and into India telling the world about “God With Us”. Legend has it that the burial place of Matthew is in the ruins of a monastery on Lake Issyk-Kul in Kyrgyzstan. In fact the early church spread throughout Asia in the years after Jesus’ death and resurrection. Tajikistan broke off from modern day Iran after the Greeks defeated the Persians. The Eastern Orthodox Church historically had a strong presence in this country. In fact they sent many missionaries to tell the people of Eastern Siberia and China about the Kingdom of God. The Nestorian movement was also at work in those days spreading the Gospel as far as Beijing and perhaps even Japan. But the church of Asia experienced a major reversal during the Middle Ages. The Islamic Empire was spreading out of the Middle East and into Central Asia during the 7th and 8th centuries. Ghengis Kahn swept westward in the late 12th century. And in the mid-14th century the Black Plague began in the steppes of Central Asia. In time this plague would wipe out a third of Europe’s population but not before taking a heavy toll in the heart of Asia. Some say that the remaining Christians in that part of the world were particularly hard hit because of their tendency to be better educated and more likely to care for those who were dying of the plague. And so it happened that what was once a growing Christian movement in Asia suddenly came to a halt. Marco Polo travelled overland along the Silk Road in the early 14th century, and he writes of a people in the Far East who would make the sign of the cross before they ate their evening meal, yet none of them could say why they did this or where the tradition had come from. Nonetheless, God had a plan for Central Asia. As Russian influence spread into this region of the world, the colonists brought the Russian Orthodox Church with them. They believed that they were directly descended from the early Christian church while the Roman Catholic Church had fallen away from the true faith as had the reformers after them. In the town of Kushka on the southern border of Turkmenistan with Afghanistan is a monument of a cross which marked the furthest extent of the Russian church during the time of Czar Catherine the Great. Although the Central Asians call themselves Muslim, it is not hard to find the ruins of churches and monasteries throughout their lands giving silent testimony to a Christian tradition that is now thousands of years old. Every Central Asia country has more than a few Russian Orthodox cathedrals with their characteristic onion-shaped domes giving witness to the dormant seeds of Christianity which are once again coming to life in the midst of the largest continent on earth. In modern times the Soviet Union did its best to eliminate Christianity within its borders. Nikita Kruschev announced that by 1980 he would show the world the last priest. But still the Spirit of God continued to work. Today President Putin himself participates in the Russian Orthodox mass on Easter and at Christmas. And the evangelical movement has never been more active either in Russia or in its former states in Central Asia. But this is not to say that all is well. In a recent conference a colleague stood up and spoke of the country where he works and ministers. He stated that not a year goes by where a member of their group is not martyred. Keep in mind that he was only talking about the expatriates in country without mentioning the many nationals who are killed for their faith. I wonder what most Christians are thinking when they tell God that they want to give their lives to Him? The followers of Jesus Christ in this country have counted the cost with their own blood! It is one thing when a man chooses to commend his life into the hands of God, but what about his family? One pastor got up to speak of his daughter who came home one day from school crying. “Why are you crying?” he said. She answered that they had taken her picture at school and put her name on a list because she was a child of Christian parents. Her classmates laughed at her and the teacher called her, “Jesus”. There was not a dry eye in the audience as this man told of his life as a believer in this Central Asian country. Do these people not know what happens to those who cause little ones to stumble? May God have mercy on their souls! The conference had 350 participants of whom 200 were nationals and 150 were expatriates who either worked in or supported the work of God’s kingdom in Central Asia. Much of the preaching and music were in Russian. Occasional comments and conversations were occurring all over the conference center in Tajik and Kyrgyz and Azerbaijani. Uzbeks and Afghans and even people from the North Caucasus were there to give testimony as to what God is doing in Central Asia. I spoke one evening with a group of pastors in my broken Russian. I asked them about the condition of healthcare in their country. Their answer broke my heart. “How can I help to bring the life that Jesus promises in a land where death is so prevalent?” I said. But their eyes told me that it is not so easy for them to confide in a stranger. The risks, after all, are great, and trust is a rare commodity in their land. His Story begins in the beginning. God created the world and it was good. But Adam and Eve thought that they had a better plan. With their sin we entered the age of the knowledge of good and evil. God could have left us there to suffer the consequences of our choices for all eternity, but He did not. He has a plan for us for good and not for evil, for a future and a hope, a hope that comes to us through the life, death and resurrection of His Son, Jesus. At the end of this present age we will once again be able to choose the good and leave the evil behind. The community of believers has experienced many trials and tribulations for thousands of years in Central Asia, and yet God has never forgotten them. Today as in centuries past we can rest in the fact that God is at work and ours is the privilege to be His witnesses to those who do not yet know His Story.